Badger’s new “RC AIR Lexan Bonding Acrylic Airbrush Colors” will transform Lexan RC car bodies into wild and exciting creations! Standard opaque’s, brilliant iridescent colors, shimmering metallic colors and hot neon’s; RC AIR Airbrush Colors, combined with creativity, will shift RC car bodies from mediocre to magnificent! 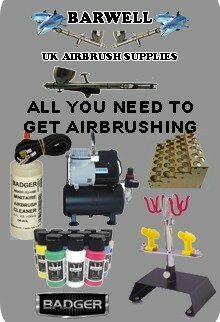 RC AIR is a safe, airbrush-ready, water-based acrylic. It contains a newly developed hardener designed to enhance the drying time for superior Lexan adhesion. RC AIR also contains a flex resin for increased flexibility and bonding durability during crashes and rollovers. Over 40 RC AIR Airbrush Colors are ideal for painting on a variety of surfaces including Lexan, resins, plastics, and many other porous and non-porous materials. RC AIR is non-toxic, low odor; it contains no harmful solvents or chemicals and meets and exceeds the ASTMD-4236 standard of excellence.